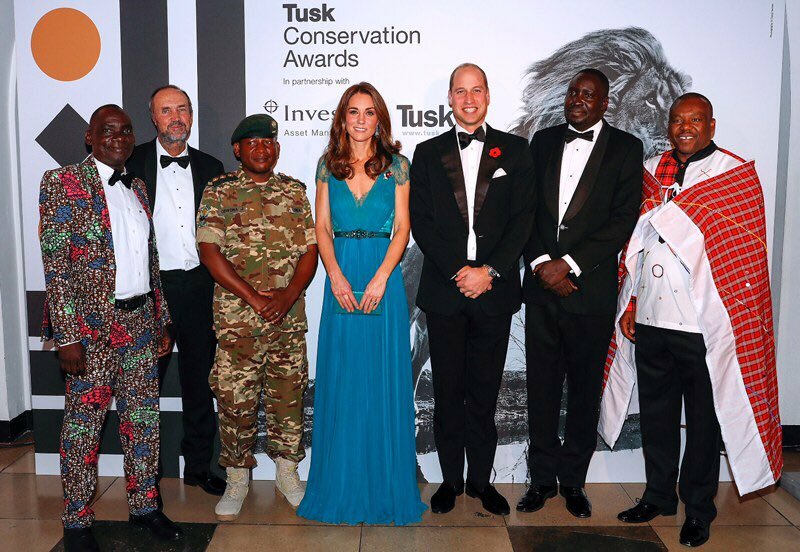 On Thursday night, the Duke and Duchess of Cambridge William and Catherine attended the Tusk Trust Conservation Awards at Banqueting Hall, a magnificent survivor of the lost royal Palace of Whitehall, in London. 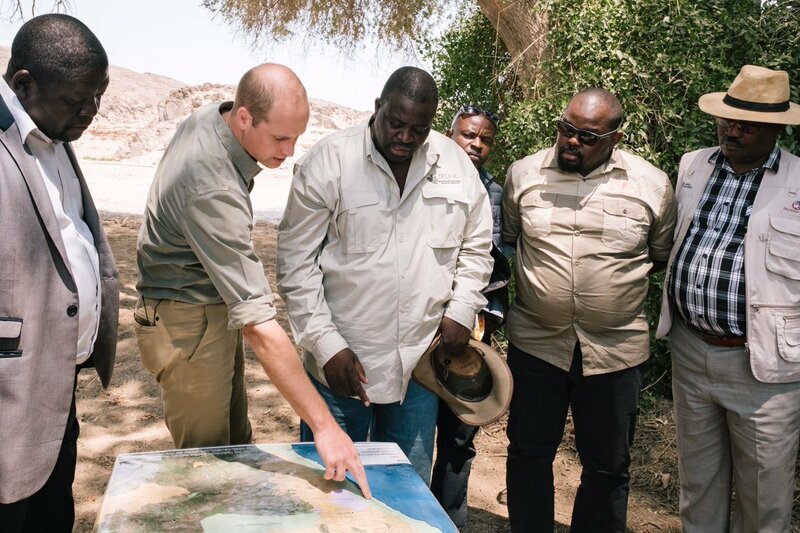 A patronage of Prince William since December 2005, for almost thirty years, Tusk Trust has supported forward-thinking and successful conservation intervention in Africa. From the plains of the Serengeti to the rainforests of the Congo Basin, Tusk has been working towards a future in which people and wildlife can both thrive across the African continent. Tusk Trust has pioneered successful conservation action in Africa by protecting wildlife, empowering communities and advancing the frontline in the fight against the illegal wildlife trade for almost three decades . 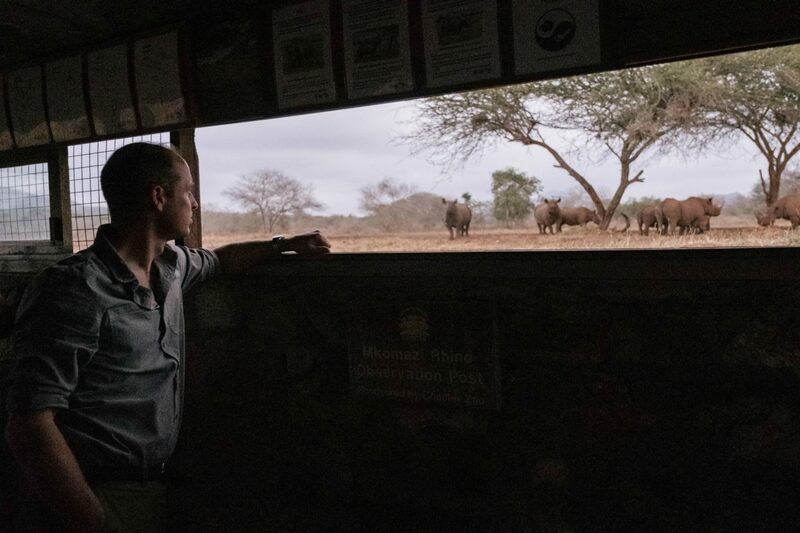 Prince William’s love for wild life conservation born during his teenage years when he visited Africa with his father Prince Charles after the untimely demise of his mother Lady Diana. Africa holds a special place in his heart as it gives him a place away from public and media glare to mourn his loss. William chose an African Country Kenya to propose his now wife Catherine in November 2010. He once said, “ I feel very protective of wildlife, which is why I get emotional about it. You want to stand up for what is vulnerable and needs protecting. Elephants, rhinos, and many others animals that are persecuted don’t have a voice“. Poaching, habitat loss and human-wildlife conflict are having a devastating impact on Africa’s wildlife. We believe local people and organisations are best positioned to address these threats, but are often under-resourced and lack the recognition they deserve. By partnering with leading and emerging conservationists across Africa, Tusk secures donor funding to invest in the best grassroots conservation initiatives – helping to increase their profile and maximise their impact. 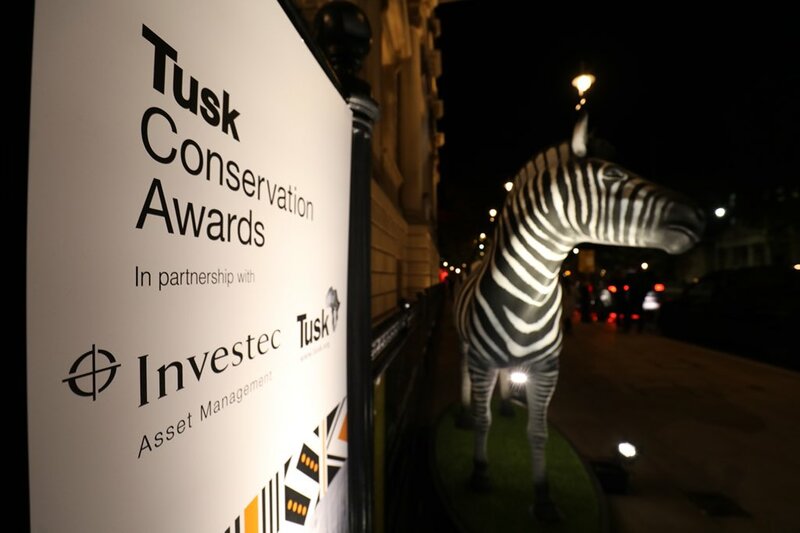 The Tusk Conservation Awards, in partnership with Investec Asset Management, gives a chance to celebrate extraordinary people, whose work and lives might otherwise go unnoticed outside their fields. Their work with wildlife and communities in Africa safeguards the future for us all. 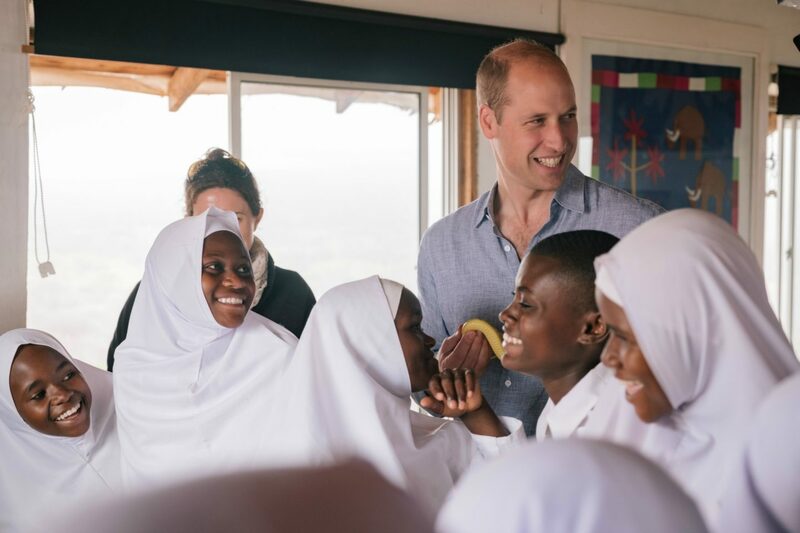 Recently William has visited Namibia and Tanzania as the patron of Tusk Trust and Royal African Society, whose patronage he took this year. Read more about Tusk Trust here. If you would like to know about the Tusk Trust Awards its official website is here. The magnificent venue of this year’s awards Banqueting Hall has a fascinating history, click here to know more about it. Tonight, Duchess attended the Tusk Awards with her husband William second time. 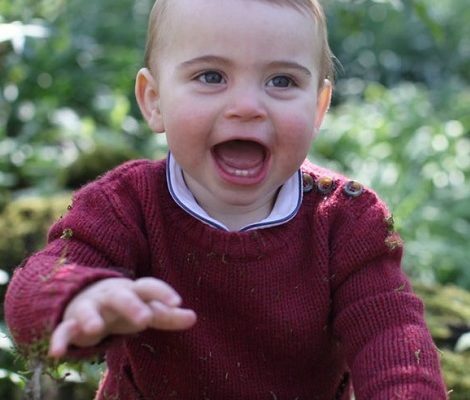 She first attended the inaugural award ceremony in September 2013, that coincidentally was her first official event after giving birth to Prince George in July 2013. A look at Duchess’s dazzling appearance at the awards in 2013 wearing a shimmering Jenny Packham gown. 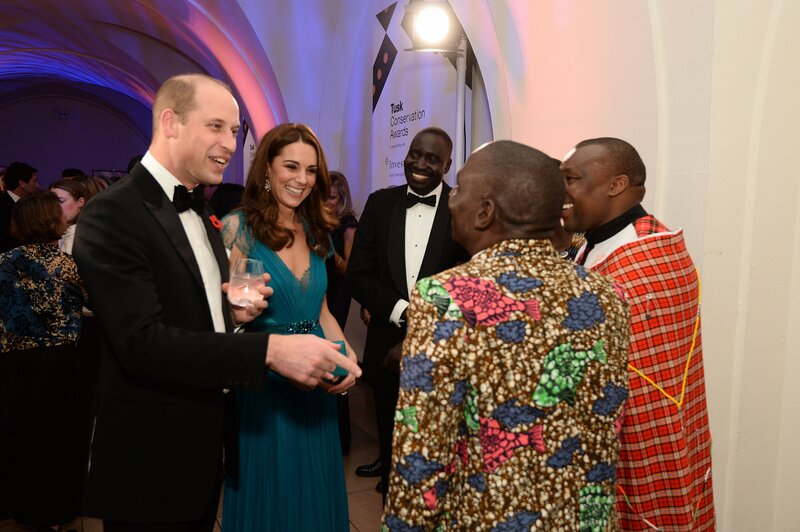 William and Catherine met with the award nominees/winners, Tusk supporters and sponsors. The host of the night was Kate Silverton. 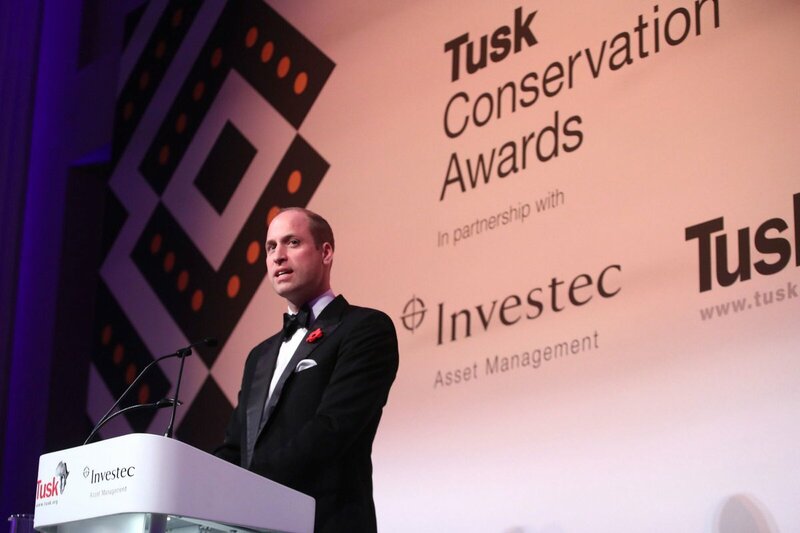 Prince William presented three awards – Tusk Award for Conservation, Tusk Wildlife Ranger Award and The Prince William Award for Conservation in Africa. 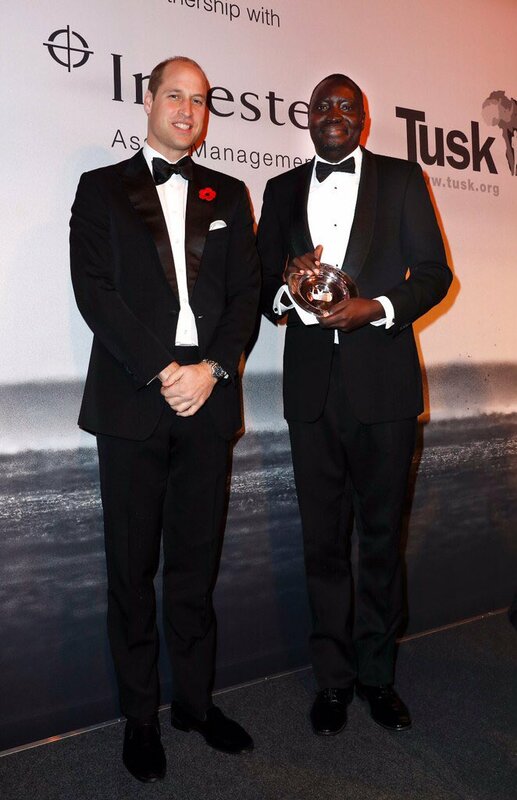 The Tusk Award for Conservation winner is Vincent Opyene. The award is given to an emerging leader in conservation in recognition of their contribution to date. Vincent has single-handedly changed how Uganda addresses the illegal wildlife trade, risking his life on a daily basis to combat wildlife trafficking and to bring criminals to justice. 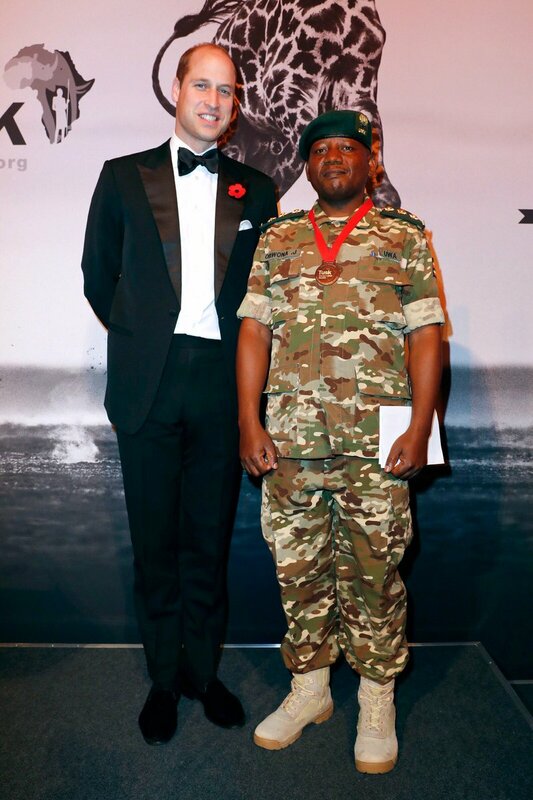 Julius Obwona received The Tusk Wildlife Ranger Award from The Duke of Cambridge for his dedication and bravery working as a ranger to protect Africa’s increasingly threatened wildlife. His leadership in Murchison Falls, Uganda has led to the prosecution of 720 suspects involved in wildlife related crimes, and the number of elephants killed by paochers has dropped from three a day to three a month. 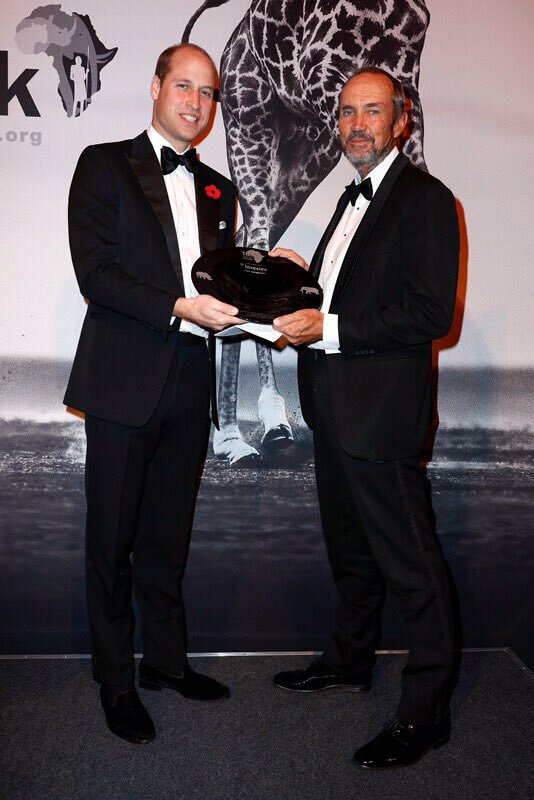 Pete Morkel was presented with The Prince William Award for Conservation in Africa – a lifetime achievement award which commends outstanding dedication and contribution to conservation. 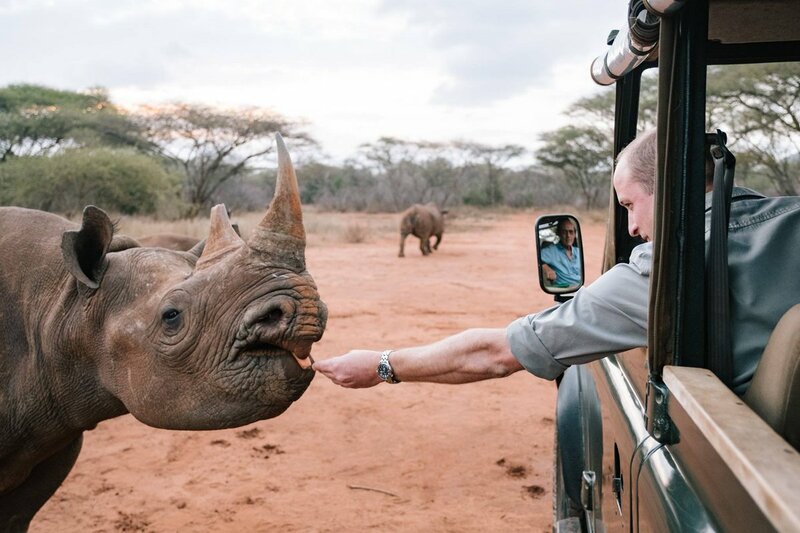 Through his successful work in capturing a range of wildlife including rhino, elephant and giraffe, a much higher level of knowledge on these species as been acquired throughout Africa, ultimately helping with their management, protection and wider conservation. William and Catherine with the award winners. A video by the Royal Family Channel. 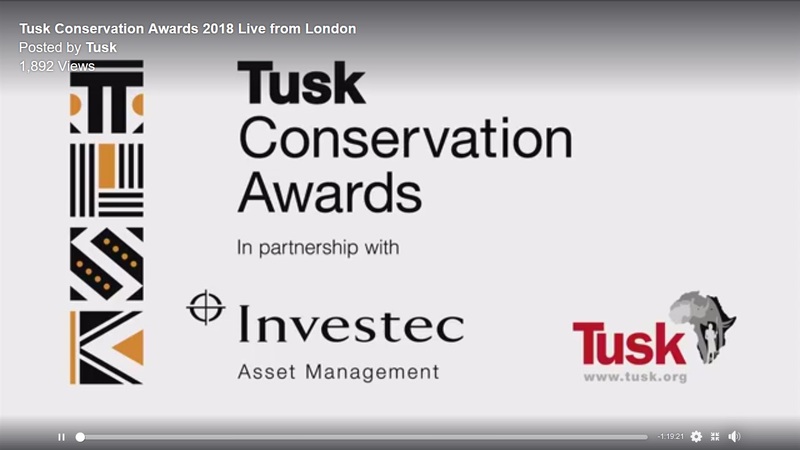 Catherine and I are delighted to be here again at the Tusk Conservation Awards. It is always a pleasure to help celebrate the exceptional achievements of the award winners and finalists. 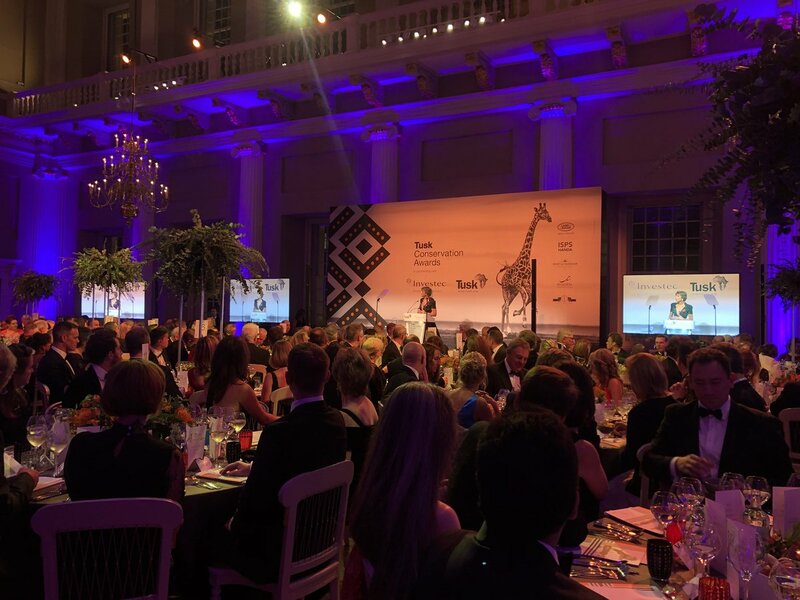 I would like to acknowledge the support of all tonight’s sponsors, particularly Investec Asset Management and Land Rover, for continuing to make this evening possible. Thank you for your generosity. As ever, I am inspired and humbled by the sheer dedication and commitment that our 2018 nominees have demonstrated. It never ceases to amaze me how they achieve so much against the odds and with so few resources. But tonight is also time for sober reflection. It was deeply moving to read the names of the men and women who have made the ultimate sacrifice for conservation. Their deaths are a terrible and tragic loss. Amongst the names listed were two leading investigators, Esmond Bradley Martin and Wayne Lotter. Each of them had worked tirelessly in the battle against the illegal wildlife trade. Their deaths, like all of the rangers, represent a huge loss to the conservation world. Esmond was the first person to highlight the scale of the international consumer demand for ivory and rhino horn back in the 1980s. And Wayne’s dedication to tackling poaching meant he became a target for the traffickers he was trying to expose. We should all be inspired by the courage that Wayne’s partner Krissie is showing as she continues this important work. As with many of the rangers who lost their lives this year, both Esmond and Wayne would surely have been worthy recipients of a Tusk award. Tonight we remember their bravery and selfless commitment. A few weeks ago I was lucky enough to visit Namibia and Tanzania to see some programmes that Tusk supports for myself. In Namibia it was fantastic to see desert rhino roaming freely in the beautiful, Mars-like landscape of the Kunene Region. 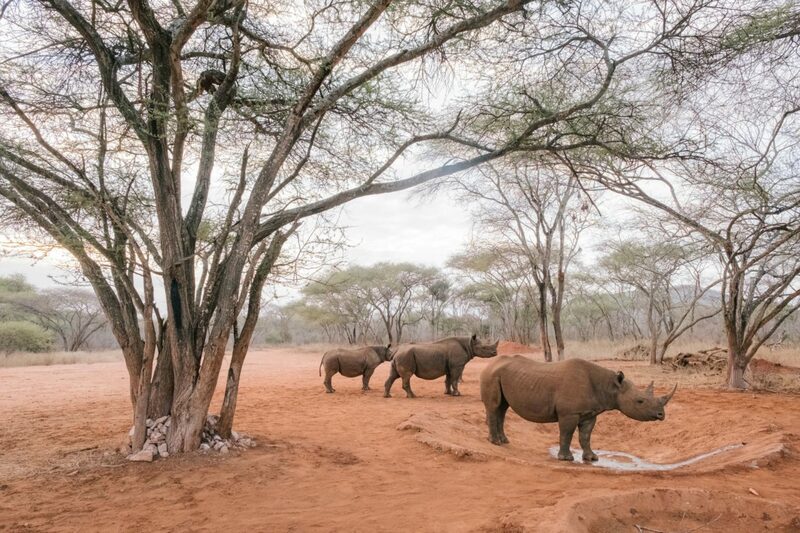 Even if Charlie Mayhew did make me get up at 5am and take a 5-hour round trip to see a rhino for only 30 seconds! I met many Namibian conservationists who are doing inspiring work in Kunene to increase the benefits for local communities. It was music to my ears to hear the women and elders of the People’s Park Initiative describe wildlife as an important economic asset that they had to protect for generations to come. And in Tanzania, I saw how Mkomazi, a once decimated game reserve, has been successfully rehabilitated into a National Park. Mkomazi’s vibrant outreach programme is teaching school children from neighbouring communities to respect and protect the magnificent wildlife and habitats on their doorstep. This sort of work on the front-line remains crucial if we are to succeed in protecting the world’s iconic and endangered species.It was great to see so many countries come together to reaffirm their commitments at the Illegal Wildlife Trade Conference, here in London, last month. But for the tide to really turn on the trade, we require consistent, global political leadership and action. Recent announcements that weaken commitments on rhino horn and tiger parts are deeply concerning. We must fiercely protect the fragile gains we have made. These gains are even more important in the face of last week’s Living Planet Report. This was a stark reminder that in just 40 years we have destroyed 60% of the world’s mammals, fish, birds and reptile species. Our own survival is reliant on our ability to reverse the terrifying decline in the world’s biodiversity. Modern human society as we know it depends on natural resources to survive and thrive. As the report says – ‘nature is not just a nice to have’. Two years ago at this event, Sir David Attenborough warned that man is losing his own connection with nature. The IPCC’s recent report was the loudest warning bell yet from the scientific community that we must act now. The clock is ticking towards a tipping point when the impact of what we are doing will become dangerously irreversible. Whether we are living in an urban or rural environment, nature matters to us all. We have a responsibility and an obligation to the next generation to drastically reduce the extent to which we plunder the planet’s natural resources. Let me finish by congratulating the winners and finalists again for their incredible work and achievements. We can only hope to shine a spotlight on a few each year through these awards. But in doing so, we rightly continue to uncover some of the unsung heroes of conservation in Africa. You can watch the full award ceremony here on Facebook. Duchess’ appearance at the Awards was greatly anticipated. 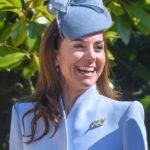 As it was a black-tie event, the royal watchers were keenly predicting what Duchess will wear and many of them predicted correctly. Catherine brought back one of the most stunning and gorgeous piece from her wardrobe – Jenny Packham Aspen gown. The gown that she first wore in 2012 aat the ‘Our Greatest Team Rises’ Olympic gala, can be considered one of Catherine’s most iconic looks. The royal watchers on social media were thrilled to see Duchess wearing the dazzling gown once again. The gown is a customised version of the label’s ‘Aspen’ wedding gown crafted from silk chiffon. It features an intricate lace back, a crystal embellished waistline and lacy cap sleeves. When Duchess wore the gown first time in 2012, Jenny Packham described the gown as, “The style combines an emerald lace bodice embellished with Swarovski crystals and a pleated skirt, ribbon waisted with a crystal and flower embellishment and matching bespoke clutch bag“. A look at the show-stopping design of the gown. Duchess once again chose the same shoes and clutch to give us a Déjà vu of 2012. She wore Jimmy Choo platform Vamp Sandals. And carried matching Jenny Packham clutch that she carried back in 2012. This time Duchess topped off her look with Queen’s Diamond Chandelier Earrings that she has on loan from Queen since 2011. 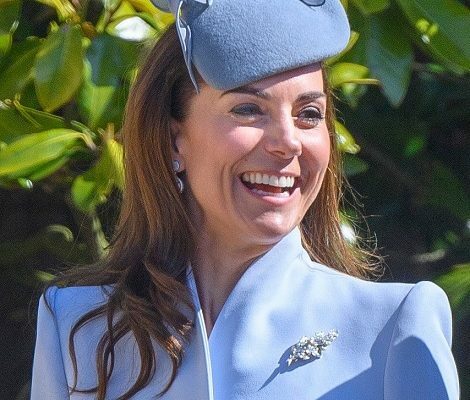 Catherine was seen wearing Women of The First World War Brooch available on Poppyshop she first wore last week during a visit to Imperial War Museum. “Women played a huge role in the First World War. They served as nurses in the field hospitals, and here at home. They worked in factories, making munitions. They worked on the land. And they were recognised afterwards with the right to vote. 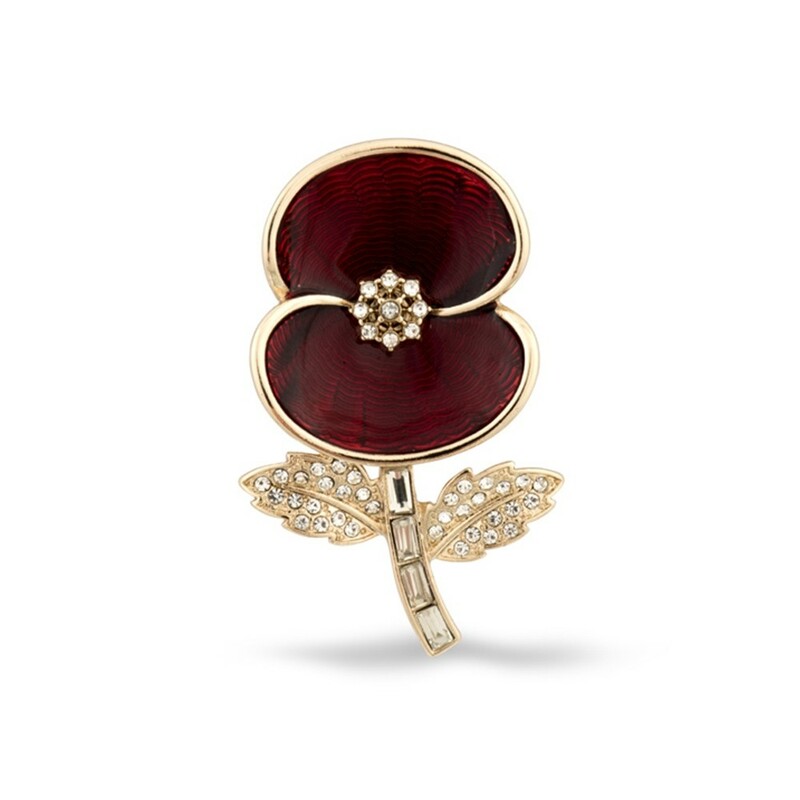 100 years on, The Royal British Legion have created this special brooch dedicated to the memory of the courageous women who served and lost their life as a direct result of the First World War. If not for the different hair style, many of us would not be able to differentiate between both appearances. It’s amazing to see Catherine in the 6 yrs old dress after three pregnancies. Speaking about the pregnancies, tonight, we also got a special royal treat. 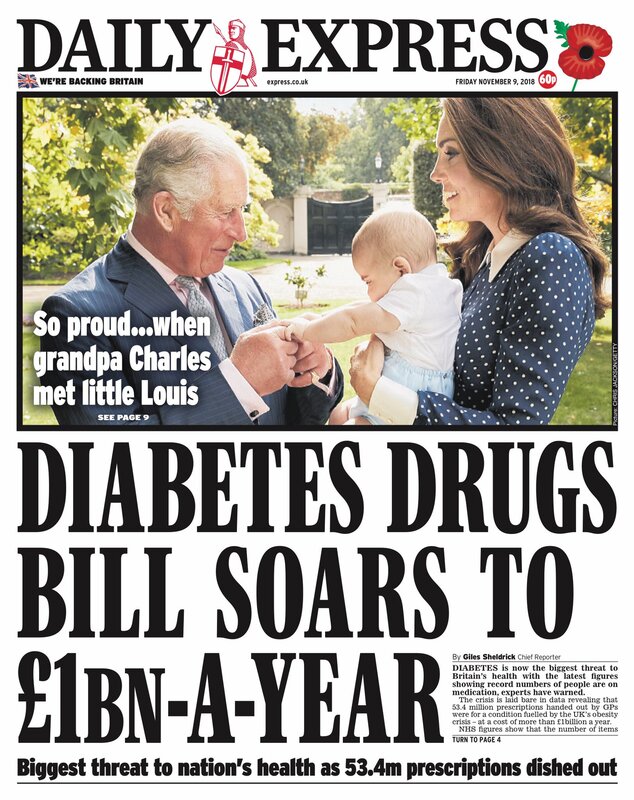 Daily Express printed a very cute picture of Catherine and Prince Louis with Prince Charles of Wales. 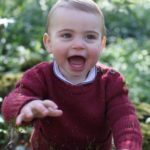 The picture was taken by Chris Jackson in the gardens of Charles’ London residence Clarence House in September this year. 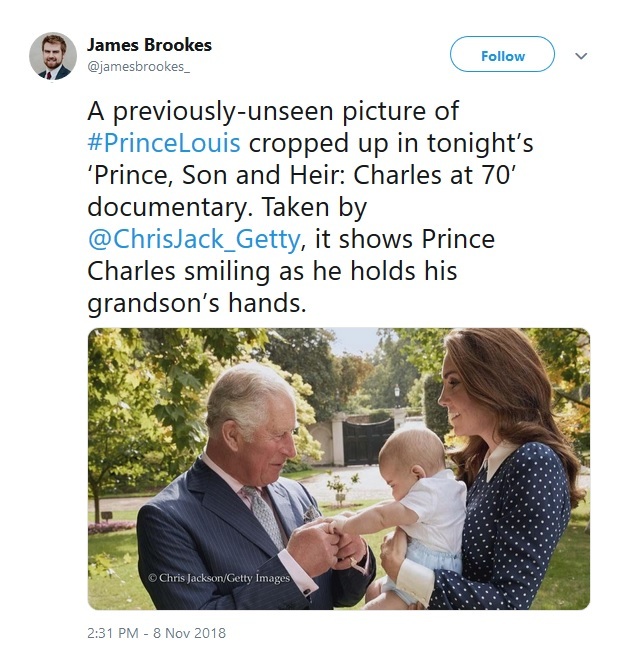 In picture we can see a chubby cheek Louis giggling when his dotting Grandpa Wales (as George and Charlotte call him) is holding his both hands. The picture was released to coincide with the BBCOne documentary to mark the Charles’ 70th birthday. The documentary is available on You tube. Catherine is a beaming mother in the picture looking happily at his son and Father-in-Law. 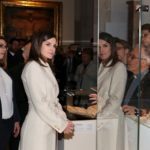 The talented HeavanLM on twitter identified the Duchess’s dress. 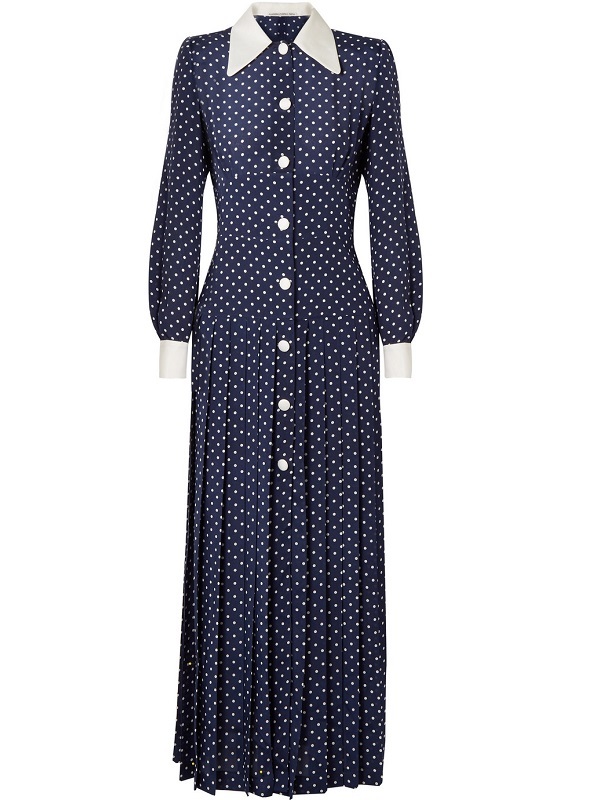 She is wearing Alessandra Rich Pleated polka-dot silk crepe de chine midi dress. 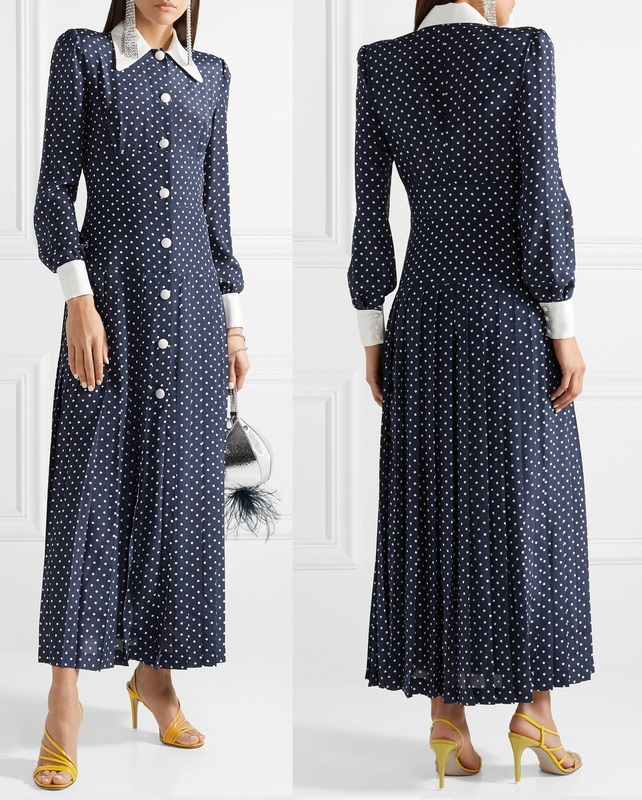 Inspired by Alfred Eisenstaedt’s 1945 photograph of a sailor kissing a stranger in Times Square for label’s Spring ’18 collection, capturing the essence of that iconic moment, this vintage-inspired dress is cut from polka-dot silk crepe de chine that falls to a pleated midi skirt. Highlight its retro feel with yellow sandals. The £1,225 dress is not available any more. 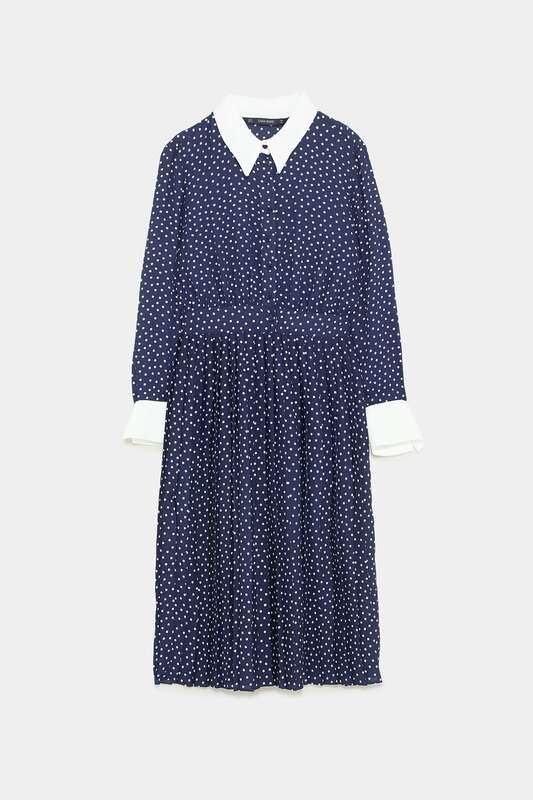 But the Spanish label Zara has a fabulous replikate. November 11 – Special Armitice Day service at Westminster Abbey marking its 100 years. Next Week Duke and Duchess will visit South Yorkshire on November 14, where they will open a new Technology Centre and visit Center Point UK hostel. On the same day, in the evening, Queen will host a lavish dinner in the honour of Prince Charles’ 70th birthday at Buckingham Palace.